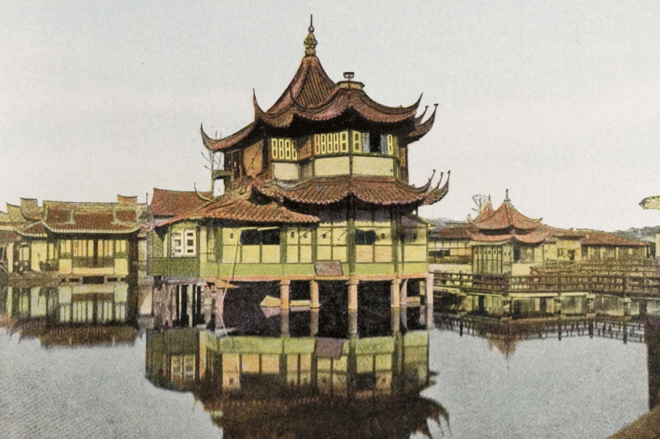 In the Old City of Shanghai, just outside the Yu Yuan Garden, sits the Huxinting tea house, said to have been built during the Ming Dynasty (1368-1644) as a private retreat, and restored in 1855, when it became a public tea house. The tea house is reached via the Bridge of Nine Turnings, designed to frustrate evil spirits, who prefer to travel in straight lines. Westerners have long referred to it as the Willow Pattern Teahouse, as it resembles the scene from the classic blue & white Willow chinaware.